A creative community that loves any excuse to celebrate, Boulder is never short on fun events — from a bustling farmers market to live music beneath the stars. But for a truly unforgettable experience, you won’t want to miss these special annual festivals. They’re a great way to peek into the local lifestyle and find out what Boulderites get most excited about. Wander through Boulder’s Central Park, adorned in more than 225,000 twinkling lights that are switched on from 5–11pm daily. There is a festive ice skating rink, right next to the beautiful Boulder Dushanbe Teahouse and Boulder Museum of Contemporary Art, and special evening events. This four-day celebration of all-things cinema draws more than 25,000 fellow fans, media and industry members every spring. BIFF is the party of the season, taking over most of downtown Boulder with screenings of documentaries, feature films and shorts — plus a celebrity red carpet, filmmaker happy hours, live-music performances, multiple galas, culinary experiences and kids’ events. Boulder Arts Week is a citywide event celebrating Boulder’s vibrant arts and culture scene. This weeklong festival features a First Friday art walk, special artist demonstrations, lectures, workshops and dozens of performances. Interact with local artists, see exhibits at galleries throughout the city and become immersed in creativity at a film screening or live concert. Every spring, Pearl Street’s flower beds bloom with thousands of tulips — a sight in and of itself. This festival celebrates the beloved tulips in all their glory and is geared toward children. Hundreds of wee ones come dressed as fairies and elves. Watch (or join!) the Tulip Fairy Parade along Pearl Street and enjoy activities such as foam sword dueling and face painting. Sample your way through artful culinary presentations by some of Boulder’s most celebrated chefs, restaurants and wineries. The tastings happen inside Pearl Street’s shops, where attendees mingle, taste, sip and shop. See the chefs in action, talk to the winemakers and browse Boulder’s coolest stores. 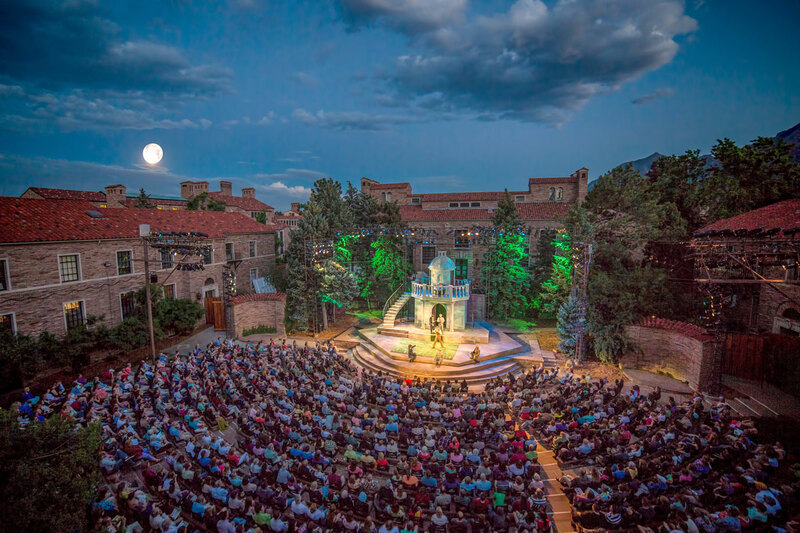 The Colorado Shakespeare Festival brings to life the imagination of The Bard beneath the night sky in a spectacular setting on the University of Colorado campus. Every summer, this professional theater company produces legendary works at two CU theaters: the historic Mary Rippon Outdoor Theatre and the recently renovated indoor University Theatre. Guests often bring a picnic to enjoy on the front lawn before the show. Expand your musical repertoire at this summer concert series, where unexpected performances come standard. From hip-hop tracks remixed with Beethoven classics to original compositions set to Pulitzer Prize-winning poetry, each concert during Colorado Music Festival surprises and inspires. Performances are held at the beautiful Chautauqua Auditorium, a cool, old, barn-like building that’s acoustically exceptional. Bring a picnic and sprawl out on the grassy field at the foot of the Flatirons. Spend July 4th on the banks of the Boulder Reservoir, where folks gather for picnicking, boating and splashing in the water. Run or walk in the 5/10k Star Spangled Splash race in the morning, and then stand-up paddleboard on the reservoir in the afternoon. Once the sun starts going down, follow the crowds to Folsom Field football stadium on the University of Colorado Boulder campus for Ralphie’s Independence Day Blast, a beloved tradition since 1941. You’ll see Ralphie (CU’s real buffalo mascot), hear live music and watch a spectacular fireworks display. Sample the best craft beers from Boulder and beyond at this annual festival, where more than 20 breweries offer their signature suds. While you’re here, listen to live music, fill up on flavorful street food from one of the many food trucks and play lawn games in Central Park next to the babbling Boulder Creek. *Attendees must be 21 or older with valid photo identification. With its brilliant fall colors and near-perfect weather, autumn in Boulder is home run. Celebrate the season at this annual fall festival featuring live music, craft beers, children’s activities and Firefly Handmade Market, showcasing the handcrafted wares of more than 100 local artisans. Experience the best of Burgundy at this luxurious wine festival, where notable chefs and master sommeliers create unforgettable culinary experiences, and in-depth seminars delve into the nuances of rare wines. If you’re only able to attend one event, don’t miss the Grand Tasting, touting more than 200 exceptional wines to swirl and sip. Find more annual festivals here and a events, too.